Extended detached house offered for sale with no upward chain. The property offers versatile accommodation and briefly comprises an entrance hallway, shower room, dining room with archway to the living room, kitchen, second WC and bedroom to the ground floor. Three further bedrooms occupy the first floor. There are gardens front and rear, a driveway and detached garage with power and lighting. The property is in a popular, established residential area close to a wide range of amenities including schools, shops and public transport links as well as recreational and leisure facilities. An internal viewing of the property is recommended in order to appreciate both the accommodation and location; contact us now to book your personal viewing appointment. SHOWER ROOM White suite comprising a low flush WC, pedestal wash hand basin and walk in shower with an electric shower. Tiled walls, tiled floor, radiator, extractor, spot lights and a uPVC double glazed opaque window to the rear. LIVING ROOM 16′ 9″ x 10′ 10″ to the back of the chimney breast (5.13 m x 3.32m) uPVC double glazed window to the side and a uPVC double glazed bow window to the front. Radiators, to aerial and gas fire suite. WC Low level WC and extractor. KITCHEN 8′ 2″ x 10′ 7″ (2.50m x 3.24m) Fitted kitchen comprising wall and base units with a work surface incorporating a sink unit. Fitted oven and grill, gas hob and extractor hood. Spaces for a washing machine and fridge. uPVC double glazed windows to the side and rear. BEDROOM THREE 10′ 1″ to the maximum x 9′ 6″ (3.09m x 2.92m) uPVC double glazed window to the front, TV aerial and a radiator. LANDING Access to the loft, doors to the bedroom and built in storage cupboard housing the boiler. BEDROOM ONE 11′ 0″ x 11′ 3″ (3.36m x 3.43m) uPVC double glazed window to the rear, radiator, stripped wood flooring and storage in the eaves. BEDROOM TWO 10′ 9″ x 9′ 7″ to the maximum (3.30m x 2.94m) uPVC double glazed window to the front, radiator and storage in the eaves. BEDROOM FOUR 6′ 10″ x 8′ 5″ both measured to the maximum (2.09m x 2.58m) uPVC double glazed window to the side, stripped wood floors and storage into the eaves. OUTSIDE There is a lawn garden at the front with borders for plants and shrubs and a driveway at the side providing off street parking and gives access to the detached garage. 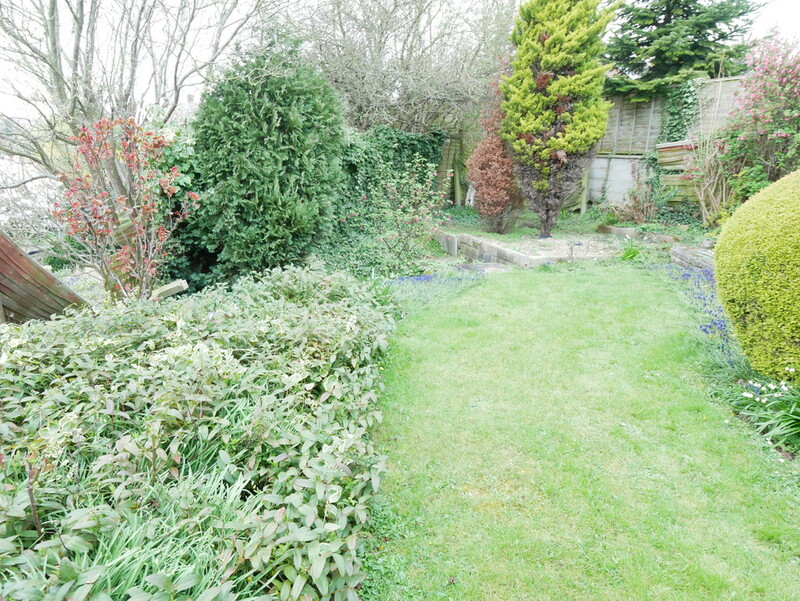 There is gated access at the side leading to the rear garden which has a patio area and lawn garden. GARAGE 16′ 7″ x 8′ 5″ (5.08m x 2.58m) Having an up and over door, uPVC double glazed window to the rear, personnel door to the side, power and light.